Janke AL, O'Brien K, Bollmann S, Kober T, Marstaller L, Barth M. A 7T Human Brain Microstructure Atlas by Minimum Deformation Averaging at 300um. In 24th Annual ISMRM Scientific Meeting and Exhibition, Singapore. MP2RAGE: 48 (16 female, 31.1±8.6yr) individuals were imaged using a prototype MP2RAGE sequence with a range of resolutions: 0.5mm (18 indiv. ), 0.75mm (21), 1.0mm (8) and 1.3mm (1). TR= 4330ms, TI1/TI2=750/2370ms, TE=2.8ms, flip angle=5,6, and GRAPPA = 3. The image matrix was typically 256x300x320 or 420x378x288 but was dependent upon coverage and FOV. The MP2RAGE denoised images [6, 7] were intensity-normalised using a histogram clamping technique. 6. O'Brien, Kieran R., et al. 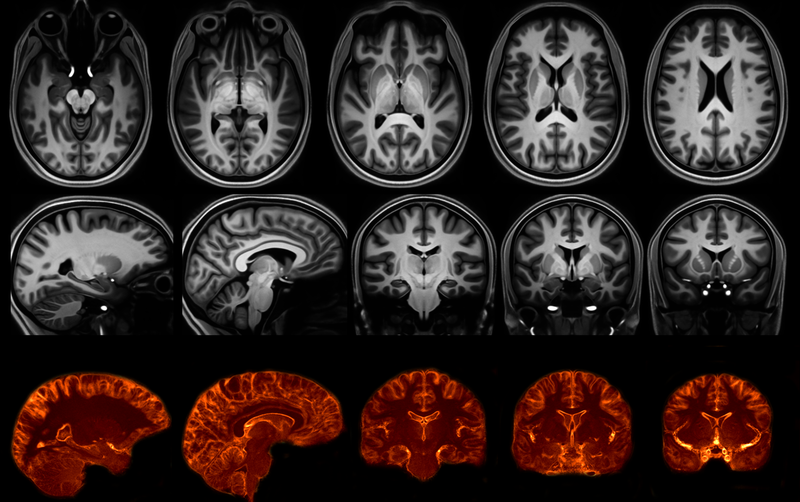 "Robust T1-Weighted Structural Brain Imaging and Morphometry at 7T Using MP2RAGE." (2014): e99676.